Hello all from the currently blue skied Sakaerat biosphere! 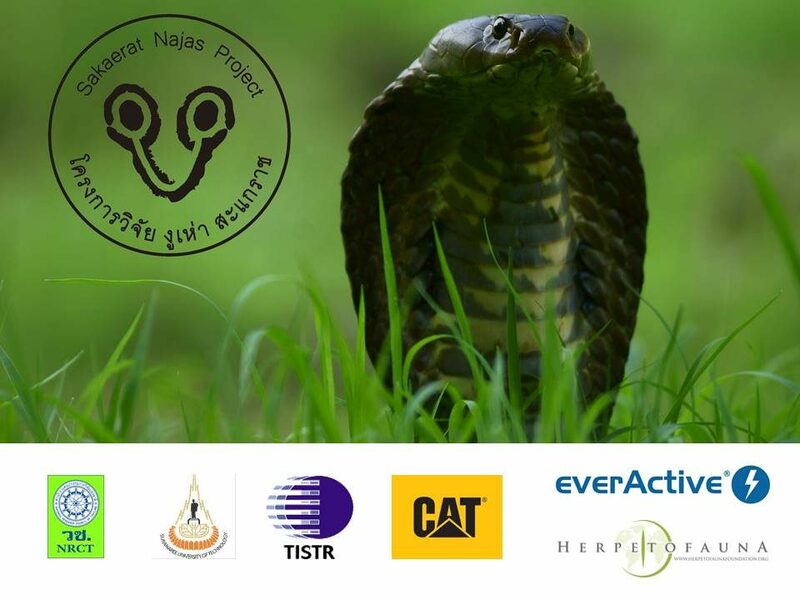 We’ve been as busy as ever, mostly due to a high frequency of movements from every one of the Cobras we are tracking. Also, due to three of our radiotelemetry receivers being in repair, keeping up with our snakes has proved challenging but we are rising to the task and gathering some great data as well as getting plenty of camera trap photos that will be posted online soon. This month the Sakerat Najas team welcomed two new volunteers: Richy Pulman and Joseph Surivong. Richy is due to stay for at least six months, and Joseph will return to university in September, with a view to returning to the Najas project – possibly to carry out research to aid in his dissertation for Msc. Although the Najas project would love to keep hard working and highly skilled trackers forever, we are aware that sometimes things come to an end. We have said goodbye (in style – with adventures, picnics & bbq’s) to two volunteers this month: Lydia Snow and Sam Smith. Both of these close friends had a great time here at SERS, learning lots, forming close friendships and working downright hard. Their tracking abilities are already missed, as is their presence. Sam has returned to the USA (after a spot of travelling in Thailand) to continue with her studies and Lydia will be returning to England in search of more conservation work worldwide (but only after a well earned month off travelling around Cambodia). From Bart and the Sakaerat Najas Project: thank you both so very much for the effort you’ve put in here during your stay. Your professional approach and integrity will surely land you in some great positions in the future. All the best, and good luck! From everyone at SERS: We miss you and hope to see you both soon! Last month we had pleasure to host a very special guests. Legendary snake catchers from Irula tribe (India). Masi and Vadivel are catching snakes for venom extraction, they agreed to visit Thailand and help us with snake surveys. Along with them came Gowri Shankar with his intern Prianka, a well known herpetologist from Bangalore and Ajay Kartik, head curator from Madras Crocodile Bank. From left: Gowri Shankar, Vadivel, Masi, Bartosz Nadolski, Karolina Ciesielska, Prianka Swamy, Anji D’souza, Ajay Kartik. We spent almost 280 man hours in the field. We captured 20 snakes of 11 species. Two of four neonates of Pipe Snake Cylindrophus ruffus foundes in ome hole. Rice Paddy Snake Enhydris plumbea in its burrow. Ornate Flying Snake Chrysopelea ornata feeding on Toke Gecko Gecko gecko. It was relay interesting to see how these people work in the field. They look for tracks left by snakes. By looking at animal burrow they can say if it was recently used by snakes. Part of the burrow with well visible snake track. Once snake move in the hole he leaves smooth surface behind. Who said that looking for venomous snakes need to be serious? Between surveys we visited local Korean Barbecue. It is one of my very favorite ways to go out for social feeding. Las part of our trip was visit in Queen Saovabha Memorial Institute. We met Dr Lawan that took us for a walk around facilities. We are keeping fingers cross for future collaborations. After visiting backstage we took a tour around facilities for general audience. First we saw Monocled Cobra Naja kaouthia venom extraction. After that we visited exhibitions with snakes of Thailand. Many of the species presented there can be found around Sakaerat Biosphere Reserve. The fattest Monocled Cobra Naja kaouthia I have ever seen. Prianka with King Cobra Ophiophagus hannah. Finally after twelve days their trip come to the end. We are planing to organize two more visits in different part of year to find more snakes! Stay tuned.